A new exhibit at the Hoboken Historical Museum uses an augmented reality app to showcase the transformation of Hudson County municipalities. The exhibit is comprised of over 700 historic postcards from all of Hudson County’s 12 municipalities, most of them date back to the Golden Age of postcards, from 1900 to the 1920s. Images show parks, street scenes, important municipal buildings, churches, schools, and factories, when they were brand new, as well as hand drawn pictures by some of their senders. While soaking up history and looking at the postcards is interesting in of itself, visitors are able to see the transformation of the county instantly with the assistance of an augmented reality app allowing them to easily compare current views to the historic images. The exhibit was curated by the director of the Hoboken Historical Museum, Bob Foster, and Hoboken Historical Museum Curator Rand Hoppe. Many of the postcards came from the estate of former Hoboken resident John DePalma, who collected hundreds of the historic postcards during his lifetime. These as well as others were purchased with funds from the David Webster Memorial Fund. Through the acquisition, the museum obtained over 5,000 postcards, and after careful consideration of each one, only 700 were picked to be on display. “It was really about becoming more familiar with what we had and picking what would be appropriate for visitors to see,” said Hoppe. “Sometimes they are very serious, but sometimes we had some fun and were a bit quirky,” said Hoppe pointing out two cards which show cows roaming in Hudson County. Hoppe said some of his favorite postcards include hand-drawn illustrations by some of the people who sent them. Foster said the new exhibit expands on a similar postcard exhibit the museum put on in 2005. He said that there aren’t many historical museums in the county, and he hopes by expanding it that people will come from all of the towns showcased, including East Newark. 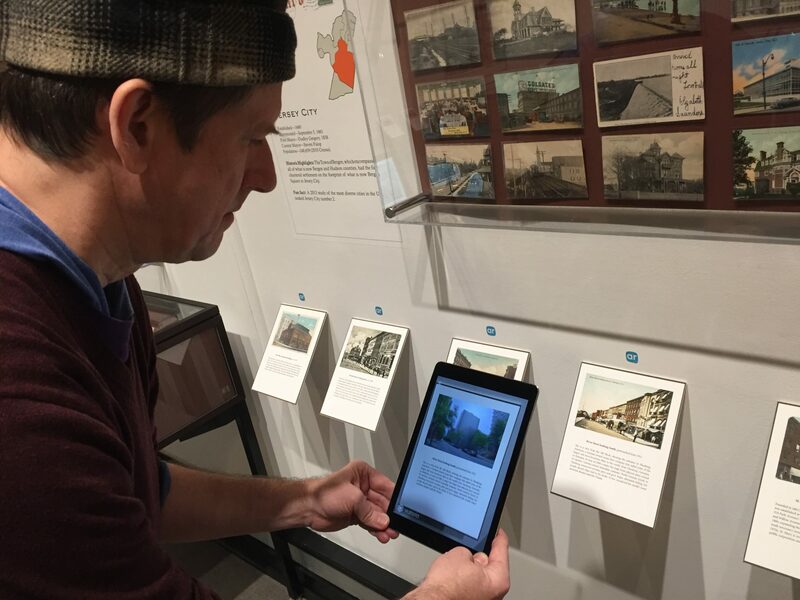 The museum enlisted the help of Stevens Institute of Technology Professor Christopher Manzione to create the app, which allows visitors to hold a smartphone in front of select postcards to see how the same street view looks today. “This seems to be the new future for museums, “ said Foster, who added that the augmented reality app allows the exhibit to come alive for those who attend. “I know it sounds clichéd, but it really acts as a window to the past,” he said. The museum also offers iPads with the app, which can be found in any app store titled HHM AR, to attendees who may need one to experience the augmented reality. Manzione studied art, according to Foster, and is the founder and director of the Virtual Public Art Project. He said they did not want to use Google Street View or other methods of obtaining modern images. So Manzione went to each selected location and took photos from the same point of view as the selected postcards. Each view old and new is narrated in the app in the voices of a cast of Hudson County residents. “We tried to get a diverse cast of Hudson County residents, but sometimes we would just stand in the breezeway here and grab people to do it,” Foster laughed. Foster said the museum has already had school groups attend the exhibit and the app was a big hit. He said the museum also gave the students a lesson on how to write an address, and each child got to write a postcard to a friend or family member and place it in a vintage mailbox from 1880. These postcards will then be delivered to the US Postal Service who will deliver them daily.